What a week!! I sure remember being a student. And student teaching was interesting. But being THE teacher is something different entirely. I've been blessed to get a job teaching what I love (English) in a charter school that stresses the arts and literacy, plus there's a heavy parental involvement (stories about the parents could be a blog onto themselves, so we'll leave it at that). This is my first year (my first full week) and I can see that there are going to be frustrations and rewards. Now that both my husband and I are working full time, time in the garden is limited to some evening work. So today we spent the day out working in the yard getting everything caught up that I would normally have taken care of during the week. Today we picked a LOT of veggies. The picture is only a small portion. We invited Mally and Luke over for dinner. And while the husbands grilled themselves some MANLY (it has to be said in a deep voice like they do) MANLY meat, Mally and I made a cold salad of tomatoes, cucumbers, red onion, corn, and jalapenos. All the ingredients were picked fresh today from either my or Mally's garden. Neither of us has a big garden, but the bounty we picked today, and the blessings of friends and sharing a meal with the fresh and truly delicious veggies more than makes up for anything. Next year, my husband and I have already figured out how to almost double the size of the garden. It will mean double the work, but I'm up for it. This was my first year of gardening, and I learned a LOT from everyone here. And I thank you all. But what I learned most is that sharing the fun and the results is the best thing of all. Well done Libby! That sampling looks scrumptious. And yep... sure taste better not only being home grown... but also being shared amongst friends. WOW what a delicious looking crop Liberty. Well done and congratulations. You certainly seem to have green fingers so it's onwards and upwards from now on. 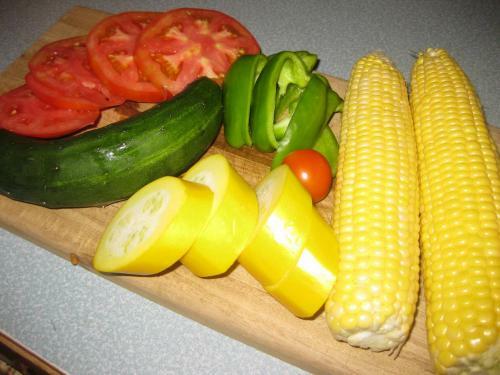 There is nothing quite like the taste of home grown veggies.